In my last communication, we touched on how vital studying and abiding in God's Word is and I pray as a result, we've taken time to evaluate our priorities including our time with Him and have purposed to set time aside to make God's Word more of a priority. In this communication I am going to do a brief "fly over" description of 5 of the many common Bible study methods to give you a some information to check out and try out. As followers of Christ, we're to continually learn and grow in our relationship with Christ and this includes growing in wisdom and knowledge through regular intentional study of God's Word. God's Word is an should be a delight to us heart, mind, and soul! 1. Devotional Method: This is typically where a portion of Scripture is selected, you read it, pray about it, meditate on it and the Holy Spirit shows you a way to apply the truth to your life through personal application. This can be done via your own Bible or prepared examples of this can be found via Our Daily Bread, InTouch by Dr. Stanley, CrossWalk.com, as well as devotions you find here on A Shepherd's Heart. There are many devotional type study options available. This method is typically high-level but you can make it more in-depth as you drill into the scriptures, words, principles, cross references, etc. Other than simply reading your Bible, this is a good place to start and a good general method of studying God's Word. 2. S.O.A.P. Method: This method contains four parts which are Scripture, Observation, Application, and Prayer. 3. Inductive / OIA Study Method: This method incorporates 3 elements which are Observation, Interpretation, and Application. The goal really is to drill down into what God is teaching. This method can be shaped into a brief or more in-depth study time and it's a great way to approach and study God's Word for yourself instead of relying on the interpretation or understanding of others only. 5. Word Study Method: This method focuses on specific words of the Bible. Such as "Grace", "Love", "Hope", "Forgiveness", "Money", "Sin" or whatever word or topic you find important. You can find out how many times a word occurs in Scripture and how it is used. Find out the original meaning of the word then build from there. It's a method that can also include digging into the original language as the meanings help solidify the teachings and context of what you're studying. There are many other study methods and resources that explain all these and more and I encourage you to explore what works for you. Get yourself a good literal Bible translation. I recommend something like the English Standard Version (ESV), New American Standard (NASB)., etc that are direct word for word translations as they are more accurate and will help you study God's Word more. A good study Bible can be a great resource as well. 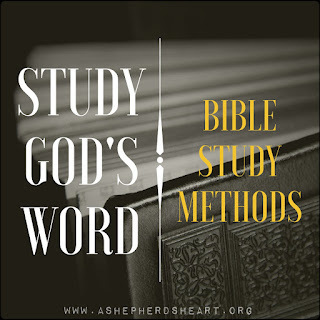 Find a Bible study method that works for you. Find a regular time that works for you as time is important but don't be afraid to change it up as needed as flexibility is important too! Always read and study a passage in context. Some of the greatest errors happen when people choose to take a verse or passage out of context and then they try to make an application that isn't Biblical or that that specific portion of Scripture does NOT make. Pay attention in church! :-) I include this as what you hear at church each week can and really be a great launching point for studying God's Word. You can focus your on digging into the scriptures covered in the message you hear to further grow in wisdom and knowledge. While it's good and right to be disciplined in your Bible study...don't ever allow yourself to become legalistic about it. Don't be afraid to change up what type of study you do from time to time. Consider joining a small group Bible study as that fellowship and accountability can be very beneficial. Never be afraid to learn new things from God's Word or to do a new study of a familiar passage that you've studied in the past. No matter what, get into The Word and continue to abide in His Word. Make His Word a priority and encourage others to do the same! P.S. Keep your eyes out for the next post where we'll take a look at scripture memorization! Disclaimer: Please note that the above links are shared for informational purposes only and the sites and content are not connected or necessarily endorsed by A Shepherd's Heart. As with any Bible study program or ministry, I encourage you to compare the teaching of any ministry, teacher, and site to what the Bible says (Acts 17:10–15).